Cedarwood Apartments provide accommodation all year round. 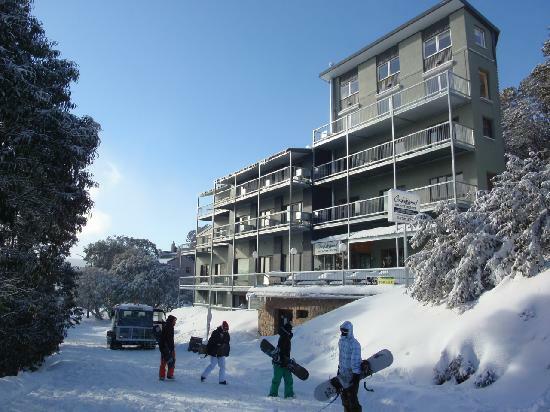 Located in the heart of the Australian Alps at Falls Creek in North East Victoria, Cedarwood Apartments provide a variety of comfortable, friendly, and warm apartments year round. With our on site manager there to help you, Cedarwood Apartments offer value in a wide range of comfortable studio or self contained apartment that sleep from groups of 2 through to groups of up to10 in private apartments. All apartments offer balconies with BBQ’s where you can take in the amazing sights sounds and smells. Most apartments are self contained (have full kitchens) and the balance are studios (with a kitchenette – no cooking). Some apartments have laundry facilities and all are centrally heated.